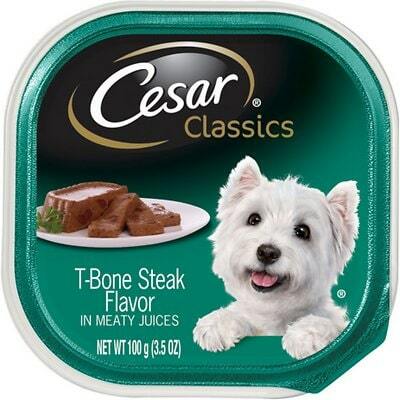 Cesar Classics Pate T-Bone Steak Flavor is a mid-priced wet dog food with overall lower quality. This product has 6 controversial ingredients, which unfortunately includes artificial preservatives, colors and flavors. The food does have pretty well-balanced amounts of protein, fat and carbs, but overall the meat and fat is low-quality. 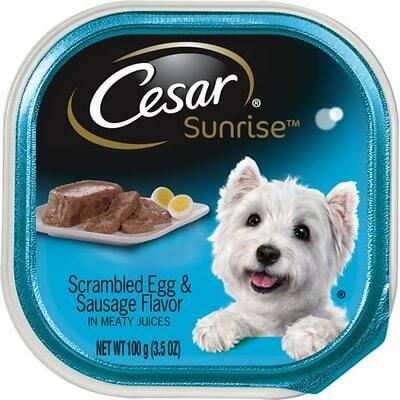 On a positive note, Cesar has a below-average number of dog food recalls. The company was also very open and helpful when answering our transparency questions. Sufficient Water for Processing, Beef By-Products, Meat By-Products, Liver, Beef, Chicken, Chicken By-Products, Added Color, Calcium Carbonate, Natural Flavors, Sodium Tripolyphosphate, Carrageenan, Dried Yam, Xanthan Gum, Potassium Chloride, Salt, Erythorbic Acid, T-Bone Steak Flavor, Guar Gum, Zinc Sulfate, Sodium Nitrite (For Color Retention), Vitamin A, D3, and E Supplements, D-Calcium Pantothenate, Thiamine Mononitrate (Vitamin B1). The average dog food we reviewed has 39 total ingredients, with 1 controversial ingredient. This product has surprising 6 total controversial ingredients and 2 of them are found in the top five ingredients. This is something to be aware of because the first five ingredients make up most of the product. Cesar makes this product in the United States. The meat quality of this product is not great. Four of the meat ingredients, beef, chicken, beef by-products and chicken by-products identify the specific animal they come from, but the by-products don’t help us understand what part of the animal. However, the other 2 meat ingredients meat by-products and liver do not make it clear what animal these ingredients are coming from, this is concerning. Since there are not any added fats, the majority of the fat content is coming from the meat, so the same concerns exist. 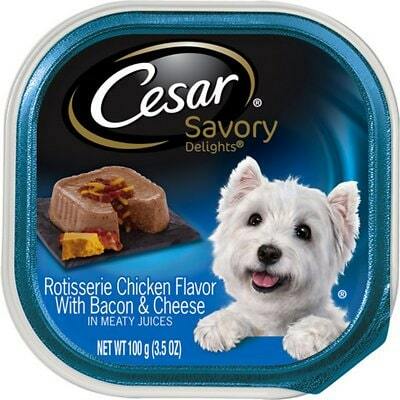 This Cesar product uses an artificial preservative called Sodium Nitrite. It’s good to know that ‍not all artificial preservatives are bad. That’s because they serve an important purpose, which is to prevent food from spoiling. However, there are 11 artificial preservatives we consider controversial because of their potential link to cancer and other serious health conditions. Unfortunately, Sodium Nitrite is one of them. 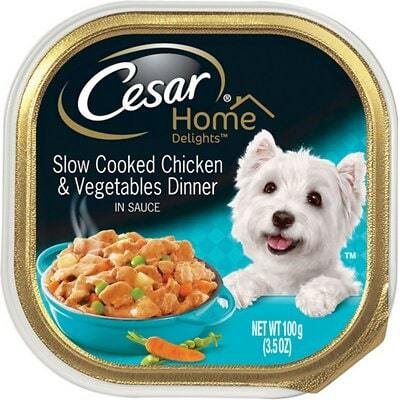 Cesar uses the generic coloring ingredient called “Added Color” in this product. 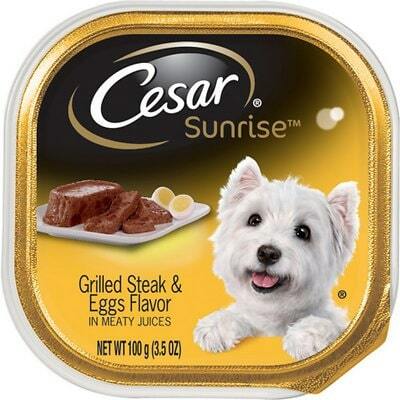 They also have an artificial flavor they have added called “T-Bone Steak Flavor”. 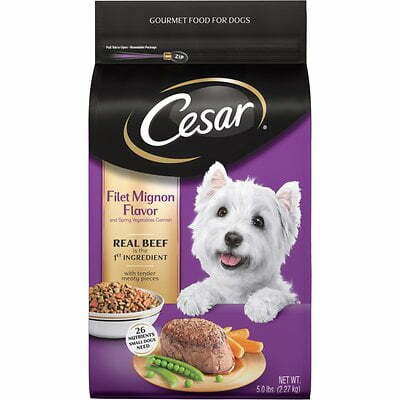 This brand has fewer than the average dog food.